MARIANNE WILLIAMSON & suzie sandoval at the SABAN THEATRE BEVERLY HILLS, CA. MY FAVORITE QUOTE BY MARIANNE WILLIAMSON. I'm the creator, curator and facilitator of Soul ZEN and I am here to guide you in your unique, self discovery journey. My gifts are derived from transforming the tragedies I endured from surviving a traumatic, multi-abusive childhood. These experiences created internal turmoil no one could relieve me of but myself and higher conscious guidance. Fortunately, with the guidance of my spirit guides, angels and healers that I have attracted into my life, I’m able to understand my circumstances from a higher perspective, self heal and teach others how to self heal into their wholeness. My story begins by entering into this world in an unsafe home filled with domestic violence, drug abuse, alcoholism, infidelity, and parents who hated themselves. I was sexually abused and my life was threatened at 5 years old by one of the abusers. These circumstances are the source of my passion for humanity, deep conscious soul connections, and how I developed my intuitive, extrasensory abilities to nurture my inner peace, joy and miracles in life. I suffered from self hatred, a suicidal mindset and severe depression for most of my life. I kept all of this hidden inside of me for years not realizing how damaging these secrets were to my spirit, health, relationships and well being. Traditional methodologies for healing left me feeling even more confused, broken, isolated and suicidal. It wasn't until my mid 20's that spirituality and alternative healing methodologies were introduced into my life. By my early 30's, I began working with a ZEN therapist, Caroline Sabi, on a weekly basis for four years consecutively. She became the greatest blessing and catalyst for my ultimate "Healing Into Wholeness" transformation from the inside out. She taught me the importance of creative visualization, active listening, how to hold loving and compassionate space for myself and new alternative healing modalities such as: neurolinguistic programming with eye movement desensitization and reprocessing (EMDR), energy healing and guided visual meditations. 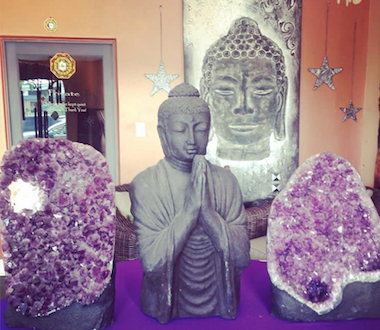 Since then, I've been blessed to work with a wide array of holistic wellness experts, alternative medicine and energy healers, spiritual teachers, meditation guides, shamans, intuitives and mystics who have contributed to the tapestry of healing modalities I’m now able to provide my clients with. With extensive ancestral and past life karma clearing, inner child work, heart (grief and pain) healing, and ZEN master training, I continue to align with the destiny of my soul. I'm able to connect with my Soul’s ZEN (higher self, inner peace, and stability.) It is a daily commitment and practice honoring my true self and it brings me joy to be here now to support my clients in their spiritual awakenings and ascension process of healing into wholeness. You too, can transform your hopeless and devastating circumstances and challenges into a thriving life filled with unconditional love, inner peace and joy. SOUL ZEN SESSIONS: Develop your intuitive abilities and divinely innate gifts to navigate your life with passion on purpose. Learn to see beyond the surface of your daily circumstances and develop an “Epic”, highly conscious perspective. MEDITATION GUIDE: Discover your favorite forms of meditation and integrate a daily habit of tuning into your Inner ZEN (peace, power and presence). Experience personalized visualizations, meditations, mantras and breathing exercises as specific remedies to best serve your unique needs.. SOUL LESSONS: Eradicate past life karma with awareness and atonement to align with your high potential future in life according to your soul lessons, divine relationships (spiritual assignments) and soul contract. ANGEL READINGS: Receive messages specific to your soul journey from spirit and your higher self. Learn how to communicate with your spiritual dream team. Awaken to a whole new world that will affirm and guide you in your journey. SPIRITUAL SELF CARE: Practice self kindness and cultivate an intimately loving relationship with yourself. Begin nourishing your spiritual self. Set healthy boundaries in your relationships and learn to detach from toxic, people places and things in your life. ENERGY HEALING: Eliminate toxic stress from your cellular body system. Reclaim your freedom and power back in your life. Learn how to understand when you are taking on other people’s energy and how to cord cut and let go of negative energy from the inside out. Develop your ability to self heal by listening deeply to the wisdom of your body, your subconscious self. AUTHENTIC SELF INTEGRATION: Learn new self discovery skills for letting go of rage, anger, shame, grief and loneliness with inner child work and heart healing. Your Soul ZEN (Oracle) Cards, are designed to divinely guide and support you at any stage of life and your soul journey. "The cards tell a story. They help us move through areas of our lives that are blocking freedom of expression, both internally and to the world." With each new card you create, you will set a powerful intention that will provide you with messages, insights and newfound awareness into the aspects of yourself that are blocking manifestation. Experience is not required. Openness, trust, and imagination are encouraged. "The longest journey you'll ever take is from your head to your heart." Learning to speak the language of your soul will provide you with the ability to communicate with the people who matter most to in deeply meaningful ways. You will feel more seen, heard and valued in your personal and professional relationships, too. CLICK HERE to take the “Discover Your Love Language” quiz. CLICK HERE to read about the importance of healing ‘Mother Wounds’. CLICK HERE to read about “Empowering Teen Girls” of our future with courage, consciousness, creative expression and authenticity. I am writing to you to express my delight after spending a wonderful session with you doing SoulZEN. My girls and I had an amazing time. Not only was the experience enlightening, it was a great bonding moment for us. 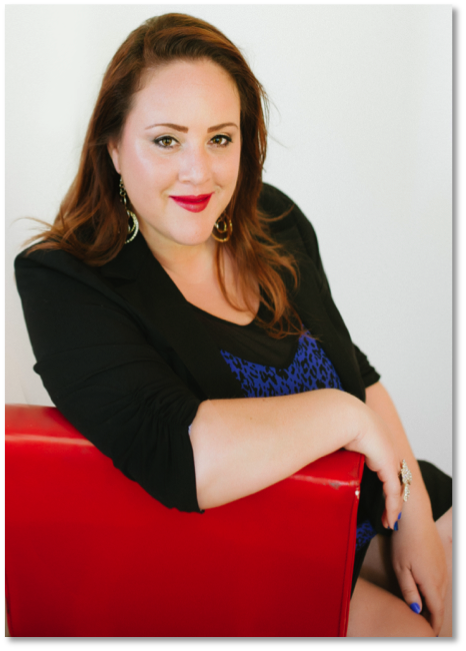 Suzie, it is so obvious that you have a natural ability to connect with people and help them to embrace their inner power. Your enthusiasm is contagious and being around you is always uplifting. OrganiZEN® is a perfect avenue for you to let those gifts shine through. I wish you well with all of your endeavors to help people through the process of channeling their personal Zen. Your passion and dedication will undoubtedly take you where you need to go to do the most good for yourself and others. My girls and I are grateful to have crossed your path and have benefited greatly from the things you have given of yourself. SoulZEN is a hidden gem that I feel everyone should experience at least once. It is enlightening to say the least. Making a vision board has helped me so much too. I look at it every day and am happy to report that Hailey has hers up on her wall above her desk. I know that it will serve her well to use it as a tool to guide her toward her dreams. 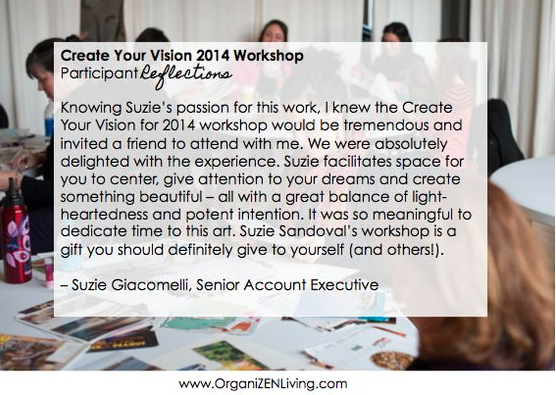 I am so happy to know that you are living authentically and living your dream, Suzie. It is a rare thing to have found ones calling. I have no doubt you have found yours. Thank you for all you do. Yours sincerely as always, Tammi and the girls.